A new, and largely unexpected, wave of militant attacks hit cities across Pakistan in the last couple of weeks. Although Pakistan has experienced terrorist attacks in the past, the timing, simultaneity and geographical spread of the new wave seems somewhat strange and therefore deserves scrutiny. Meanwhile, Pakistani military’s reaction to this particular episode of militant attacks raises questions one cannot easily ignore. The sudden spike in militant attacks across Pakistan raises eyebrows because last year the Pakistani military declared that they have “largely defeated the militant groups” across the country. Echoing the military narrative, Pakistani Prime Minister, Nawaz Sharif, also said that “the back of terrorists has been broken” and peace has been restored through large scale military operation in the country. Dubbed as “Zarb-e-Azb,” and initially launched in response to a militant attack on a Pakistani airport in mid June 2014, the Pakistani military operation had much larger objective of wiping out terrorists and dismantling their sanctuaries in Pakistan. Apparently, the much hyped ‘Zarb-e-Azb’ military operation had since been punishing the militants, and last June on completion of its second year, the Pakistani military announced that they have killed 3,500 insurgents, eliminated nearly 1,000 militant hideouts, destroyed 7,500 bomb making factories, seized some 250 tons of explosives, and recovered large catches of armaments during the operation. Meanwhile, the Pakistani media reported considerable decrease in the number of terrorist attacks and credited ‘Zarb-e-Azb’ for reduction in civilian casualties, form thousands to few hundreds, in the last couple of years. The troubling questions are how, after such a highly publicized and apparently successful military campaign, did the militants manage to pop up and hit harder than before? Most importantly, why now – why did it happen right after recent calls on the new U.S. administration to pressure Pakistan for sheltering Taliban and other terrorist groups fighting in Afghanistan? The militants hit different cities across Pakistan almost simultaneously, including places deep inside Pakistan that were least likely to be targeted in the past. Previously, the bulk of terrorist activities were concentrated along the border with Afghanistan, and therefore, the breadth and depth of the recent wave along with simultaneity of attacks raise some red flags. 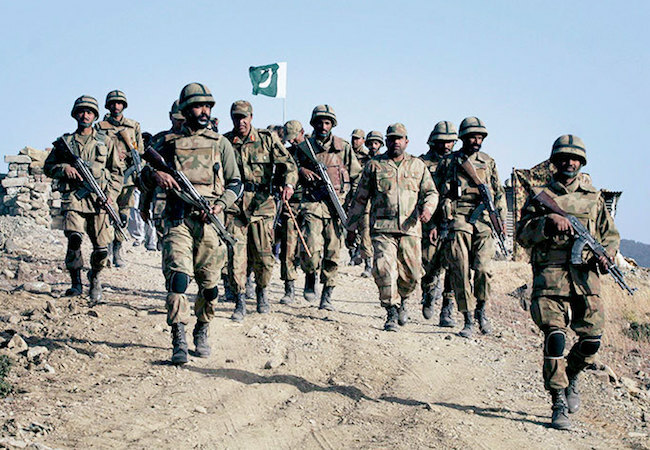 For the past two and a half years, the Pakistani army was heavily publicizing ‘Zarb-e-Azb’ military operation and proudly referenced it to international community – especially to its frustrated ally, the United States and its suspicious neighbor, Afghanistan – and to the Pakistani nation as their genuine commitment to fighting terrorism. However, the new wave of militant attacks across Pakistan casts doubt on Pakistani military’s narratives. Should the Pakistani public and the world at large believe early statements of the Pakistani military about defeating terrorist groups and dismantling their networks and safe havens in Pakistan, or blame it for the failure and feeding misinformation to the media and public? Or even worse, should they speculate about Pakistani military’s collusion with the insurgents – allowing the recent wave of attacks to happen and then play victim – to counter increasingly negative rhetoric against Pakistan as enabler of terrorist groups, and to influence the yet to be announced new U.S. administration’s policy on Afghanistan and Pakistan? Although this sounds like a wild thought, past Pakistani behavior such as sheltering Osama bin Laden, the deceased leader of al-Qaeda, and its continued support for the Taliban and its affiliates fighting U.S. and Afghan security forces, leads to such apparently out of the box thinking. Finally Pakistani army’s reaction to this episode of militant attacks is questionable at its best. Immediately after the February 16 terrorist attack on the Sufi shrine in the Pakistan’s southern Sindh province, Pakistani military establishment pointed finger towards Afghanistan and blamed it for providing sanctuaries to the Pakistani Taliban. Pakistani Army Chief, General Qamar Javed Bajwa, called General John Nicholson, the U.S.-led foreign troops commander in Afghanistan, and asked him to disrupt and dismantle anti Pakistani elements’ activities and sanctuaries in Afghanistan! At the same time, Pakistan closed all its border crossings with Afghanistan without any consultation with the Afghan government, and has since been pounding nearby Afghan provinces with artillery shells. These Pakistani moves and demands seem rather strange; in the last two years alone, more than 10,000 Afghan security forces lost their lives and another roughly 25,000 were wounded fighting militancy and terrorism that the U.S. Officials and military commanders, including General Nicholson, claim “enjoy sanctuary” in Pakistan. Meanwhile, Pakistani border closure, especially blocking Torkham and Chaman crossings that have economic significance, is motivated by political rather than security reasons because Pakistan had been strictly monitoring them well before the recent attacks on its soil. In June 2016, Pakistan implemented a strict border control measure banning Afghans, including women, elderly and patients, from entering Pakistan without a valid visa. Furthermore, closing the main commercial crossings mean as if militants go back and forth between the two countries, that share nearly 2,500 km porous border, through the main gates and highways! And lastly, shelling Afghan villages only deepens divide between the two countries and displaces local Afghans, providing opportunity for the terrorist groups to move into those places – an outcome that contradicts the apparently stated objective of the cross-border Pakistani firing. Meanwhile, even if we assume that the Afghan government is sheltering anti-Pakistani elements, are they naïve to house them near Pakistani border? If nothing else, they have at least learned and would have replicated Pakistan in hiding high value targets deep inside its territory. Overall, the points raised here are serious and cannot be totally disregarded. The new wave of militant attacks in Pakistan, though painful for ordinary Pakistanis, cannot undermine the fact that Pakistan supports terrorist groups operating in Afghanistan, and must not overcloud the recent calls on the new U.S. administration to adopt a “tougher” stance towards Pakistan for harboring terrorist groups that are not only destabilizing Afghanistan and sabotaging the U.S. mission in the country, but also are a looming threat to the region and global security. Ghulam Farooq Mujaddidi writes about contemporary Afghan and regional security issues, foreign relations of Afghanistan, and socio-political developments in the country. He is a Fulbright scholar, with MA in Political Science from University of Nebraska-Lincoln, and currently serves as the President of the American University of Afghanistan Alumni Association.